Mark your calendar for May 2! The multi course Dandelion Dinner will be held at the Tool Shed! Ticket info will be out soon! Order Sweet Gewurztraminer in our online store! A lovely semi-sweet, late harvest Alsatian style Gewurztraminer with a slightly spicy body and a light, fruity finish. Order Breitenbach Gift Boxes for the holidays! It was a great day for the Breitenbach Dog Show held on Saturday. All of the proceeds went to the Police K9 Association of Canton. The Canton K9 unit was there doing demonstrations with one of the canine officers for the crowd. We are getting our cellar cleared out to get ready for harvest! Chenin Blanc is on sale! Try this elegant light dry white with fish or alfredo. Enjoy! Show off your best fur friend at the Breitenbach Dog Show! There will be vendors, entertainment and wine! Experience and relive the '80's and of course have fun! Utilizing modern day video technology,the New Wave Nation visually transports the audience through time and back, while performing the songs live, with a current feel, using their own arrangements, and tailoring a show around audience interaction and participation. We are open December 24 from 9-3. Our Cafe is open from 11-3. We will be closed on Christmas Day. We are open from 9-6 on Dec. 26! Happy Holidays and Merry Christmas from the Bixler Family at Breitenbach Winery! Three Berry Wine is Back in a Bottle! Our Three Berry Blend is made from pure berries, lightly sweetened, and balanced with a slightly tart natural berry finish. The 2016 grape harvest has begun! It's a beautiful time of the year to visit Amish Country and Breitenbach Wine Cellars. We are open Mon-Sat from 9-6. Be sure to come to our Open House/Harvest Party on Sept. 17! We will have vendors, grape pie and ice cream, cellar tours and grape stomping! Cafe Rose is a light dry Riesling/Cabernet Rose. For a limited time it is on sale for $12.98 per bottle! Rose wines pair well with seafood, creamy pasta or pork dishes. Today was a great day for yoga! Join us next time on June 15 at 6:00 pm. Yoga is for all levels. Our location is set high on a hilltop with spectacular views surrounded by our vineyards! We are proud to announce our newest international medals! Gold medals have been awarded to Chardonnay and Pinot Grigio- two of our new dry whites! Plum is also a gold medal wine! We hope you enjoy this lively and refreshing dry white wine with notes of tropical fruits. Chenin Blanc is well balanced with a crisp acidity, making it a lovely wine to pair with a light seafood dish, quiche or an assortment of cheese. Stop in for a sample of Pinot Grigio! We are pleased to offer this light medium bodied dry white wine. The flavors are a bright fruitiness with a hint of citrus. Pair this wine with a light seafood of a variety of soup! 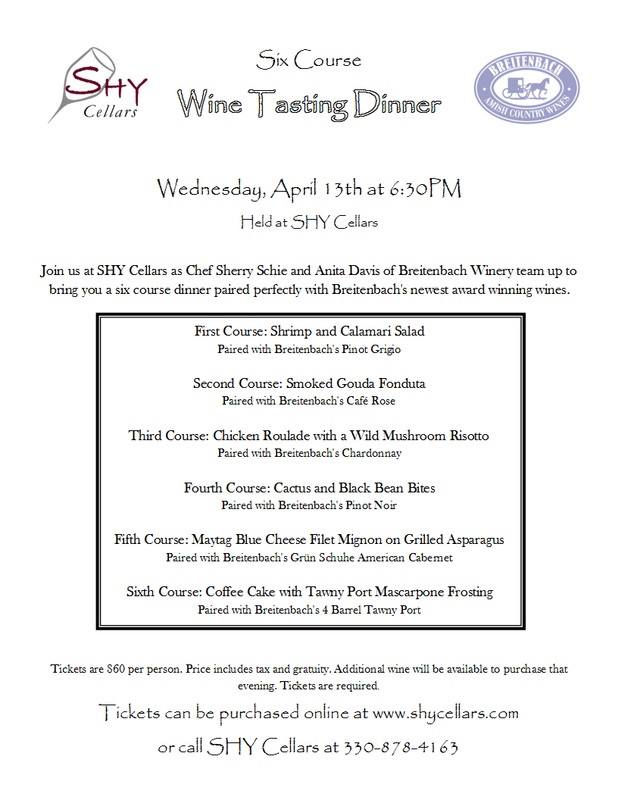 Read more about what's coming up here at Breitenbach! Fall is the busiest and best time of year in Amish County. Don't miss out!